Encompassing both computer science and digital design, web development careers are one of the top jobs in the STEM industry, projected to grow 27 percent from 2012 to 2024. With many jobs requiring just an associate degree, a modest educational investment can yield big returns. 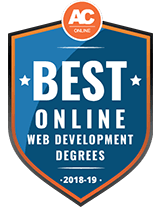 Convenient and technology-based, an online web development degree can provide the skills and experience necessary to move into this career field. Use this guide to learn more about degree benefits, program options and career opportunities. The web development field is quickly growing its need for competent and credible professionals. Earning an online degree in this field can help graduates earn the necessary credentials to enter the field while maintaining other time commitments. However, it’s important for students to enroll in a program that best aligns with their individual needs. To help students find the best web development program with online learning opportunities, we’ve created the rankings list below, basing on findings off of extensive analysis of school’s statistics and offerings. Explore the top web development programs for 2018 below. Brigham Young University - Idaho's Bachelor of Science in web design and development is a 120-credit, fully online program that prepares students to work for companies in tech-oriented positions, such as web developer/designer, information technology specialist or database designer, or in more business-oriented positions that utilize web design and development skills, which may include corporate communications, advertising or project management. Students learn principles of design and typography, as well as web development, object-oriented programming, CIT fundamentals and software development. BYUI is accredited by the Northwest Commission on Colleges and Universities. Liberty University offers a 100% online Bachelor of Science degree in information technology with a specialization in web and mobile programming that typically can be completed in 4 years. The program is delivered through Liberty's School of Business. The school is accredited by the Southern Association of Colleges and Schools Commission on Colleges, and all its programs are founded on the principles of a Christian worldview. The goal of this BS degree is to provide training to students in the convergence of IT and business, with courses in web and mobile app creation that use innovative practices in design and technology but also align with the needs of businesses. The Bachelor of Science degree in web design and development at Independence University is a 36-month program that provides training in website design, web programming, digital imaging, graphic design and digital illustration, as well as important business concepts such as marketing, database administration and entrepreneurship. Graduates may go on to work as web designers or developers, mobile app developers or in fields such as information design, e-learning development, consumer electronics development or human-computer interaction (HCI) technologies. Independence is accredited by the Accrediting Commission of Career Schools and Colleges. Accredited by the Higher Learning Commission, Bellevue University is a nonprofit institution offering more than 75 online programs. Its online Bachelor of Science in web development program is a cohort-formatted program, meaning students progress through classes together throughout the 127 credit hour program. Coursework provides training in the principles of design, client- and server-side languages, database fundamentals and web stacks to prepare students to work as software or web developers. The program emphasizes immersive and collaborative coding experiences. Prior to graduation, all Bellevue students must complete the Kirkpatrick Signature Series, a collection of 3 courses focused on Western traditions and citizenship. The University of Arizona offers more than 100 online degrees, with courses starting every 7.5 weeks. Its online Bachelor of Applied Science in informatics degree is a 2 + 2 program in collaboration with community colleges, and it's intended for those who have completed their first 2 years of general education courses and will only be completing major courses at U of A. Coursework covers the practical and theoretical aspects of computing, but in context of business and society, preparing graduates to work in system administration, software development, information management and digital design. Students aren't required to come to campus, and most classes are delivered asynchronously, so students can log on and participate at times that work with their schedules, though there may be some synchronous, or real-time, activities required. Baker College claims to only feature programs in industries that show high rates of growth, and the curricula are designed with input from industry leaders to ensure workplace relevance. One such program is its Bachelor of Science in information systems with a concentration in web development. This 120-hour program combines business training with foundations in computer information systems to provide skills in web development, project management and programming. It's intended to prepare graduates to enter the field of web development without the need for additional training or certification. 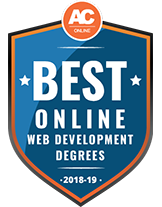 Franklin University's online Bachelor of Science in web development is a 124-hour program that prepares students to build enterprise-level websites and manage the entire web development process, including managing teams and collaborating with others. Students work with industry-standard software, such as Adobe Creative Suite and Flash, and deal with everything from coding to marketing, ecommerce and electronic supply management, so that graduates are prepared to work as web developers. The program is 100% online. Franklin prides itself on friendly transfer policies -- it accepts up to 94 previously earned college credits. A career in web development is open to anyone with the motivation to master web languages and technologies. See how one student spotted a need for user-friendly technology and turned it into a successful career. Affordability, flexibility and efficiency are the hallmarks of online learning, and for some types of degree programs, like web development, online learning is ideal. Students use many of the same programs and platforms, such as browser-based coding environments, that are used in professional settings, providing a powerful hands-on experience. With few exceptions, courses, exams, and study and discussion groups are attended online, and access to instructors, fellow students, and academic counselors is easily available. Despite physical distance, students often report a great deal of camaraderie and collaboration with their peers, leading to an online experience that is both personal and productive. Team projects and group discussions play a vital role in online education, and most students find them both motivating and rewarding. Online institutions are also expert at facilitating the learning process through technological tools such as weekly class calendars, assignment reminders and graduation tracking. There are online educational options in web development at both the undergraduate and graduate level. The list below outlines the scope of each, so prospective students can identify which will best fulfill their career goals. Certificates in web development vary widely in price and quality. Most programs fall into one of two categories: those that emphasize skill acquisition, and those that offer testing-based certificates. The highest rated programs offer both in-depth instruction and exams; however, for those who are already proficient in web development skills but lack traditional credentials, certificates based on skill testing alone are a reasonable option. In the tech industry, knowledge and experience often outweigh formal training, so an associate degree is often acceptable for entry-level employment. Many quality programs can be completed in as few as 18 months, with students fulfilling the equivalent of about 60 semester credits. Options include an associate of science degree (AS), an associate of art degree (AA), or an associate of applied science degree (AAS). The first two include courses that generally can count towards a future bachelor’s degree, while an associate of applied science degree generally does not. A bachelor’s degree can mean more extensive preparation, and lead to higher pay and leadership opportunities in web development. Completing a bachelor’s degree signifies to employers that students are dedicated to learning and doing the necessary work to move into management positions. A bachelor’s degree generally requires 120 semester hours of course credit; it often includes a senior seminar or capstone course, usually taken during the final program semester, and may require a major paper, project or internship. Online colleges and universities offer part-time and accelerated programs, allowing students to continue to work and gain experience while earning their degrees. A master’s degree in web development offers the promotion potential of a bachelor’s degree, in addition to other professional opportunities. Not only are average annual salaries higher, a master’s degree can open up new career options such as teaching or consulting. Master’s degree programs require about 30 semester credit hours and are made up of approximately two-thirds graded coursework and one-third faculty-supervised research and thesis writing. Some programs may substitute a project or internship in lieu of a written thesis. Working students may find that challenges they face on the job can be channeled into opportunities for thesis research and projects. In addition, many companies reward employees who want to obtain advanced education by helping pay for the cost of the program. In this beginner course, students learn the basics of building web pages through project-based assignments that introduce core technologies. Students become familiar with server-side languages—including PHP, ASP.NET, Ruby, Python and Java—to learn the fundamentals of back end development. Design theory, managing and meeting client expectations, budgeting, brand strategy, and usability are topics covered in this course. Topics covered include mobile platforms and development environments, the creation of single activity and multi-activity applications, user interface design, and business marketing basics. Students use advanced server-side techniques to enhance user interactivity. Projects include interactive RESTful application programming interfaces (APIs) and API-driven web applications that use asynchronous scripting language callbacks. Choose a program that works with your schedule now, and best suits your future career goals. Make sure you understand and meet program requirements such as GPA, course prerequisites, etc. Ensure that the school is accredited by a reputable organization. Speak in person with an academic counselor or other students to get a feel for the learning environment. Find out what services the school offers for job placement. Check out the financial aid options offered through the school. If you’re currently working, speak with your boss or human resources department about the program to see if they might offer any accommodations or incentives. As students begin to narrow their choices for a program in web development, it’s vital to consider the accreditation status of schools. Accredited schools are recognized and respected as ones that meet the high quality standards of accrediting institutions endorsed by the U.S. Department of Education; thus, accreditation can directly affect the value of a degree. Several other factors also come into play. For example, it’s much more likely to be able to transfer credits from an accredited school than from one that is not. In addition, students are only eligible for federal financial aid if they attend an accredited school. Web development degree programs may not always have specialized programmatic accreditation. At minimum, look for institutions accredited by one of the six major regional accrediting organizations. Please review our accreditation guide and computer science degree page for a more detailed look at the accreditation process. While researching programs and accredited institutions, it’s imperative to know the timeline for meeting application requirements. Some programs, for example, may require applications more than six months in advance. However, online programs often offer a more relaxed timeline, with applications accepted only a couple of months before the start date, such as in the example below for an online bachelor’s program. In any case, students applying for federal financial aid should start the process as early as possible to maximize their chances for funding. Submit the Free Application for Federal Student Aid (FAFSA®). Graduate High School or obtain GED and take any requisite academic, skill, or language proficiency exams. Research programs and identify several candidates. Forward high school transcripts, credit transfer requests, and standardized test scores (such as the SAT or ACT), as necessary. Complete and submit applications and any personal essay requirements. Get involved in clubs, activities and projects that are web- and technology-related, such as a STEM club, robotics engineering, or game design. Try an introductory computer science or web development class at your high school or local community college. Volunteer or intern with a company or organization that has a web team to gain experience dealing with real-world issues in design, maintenance and troubleshooting. A web designer works with clients, web developers, and marketing and sales teams to design user interfaces for a variety of websites and mobile applications. Successful web designers have excellent design skills, can develop and adhere to brand identity standards, thoroughly understand all aspects of web development, and may use front end development technologies. Back end web developers are responsible for the server side of web development. They write web software and Application Program Interfaces known as APIs; since they are responsible for enabling the front end development work, they must also be familiar with front end technologies. Back end developers must be proficient in multiple server-side languages and technologies, and have the ability to integrate their code with front-end design. Security is also within the purview of back end development. A webmaster is someone who monitors and maintains a website or multiple websites, fixes problems, makes improvements, and liaisons with various teams to ensure a positive and productive user experience. They must be familiar with all aspects of web development and design. Webmasters function as server administrators, and generally manage the day-to-day tasks associated with operating websites. A vice president of information technology manages technology-related investments, innovations and initiatives. They plan and implement IT strategies, as well as identify requirements for web systems, such as servers, software, and operating systems. They also manage the teams responsible for all web activity, development, monitoring and maintenance. A vice president of information technology is a senior level management position requiring extensive knowledge and experience. Certifications are available in all aspects of web development and can either stand alone as evidence of acquired skills, or complement a degree program. Some web development certificates are issued by technology companies themselves, while others are offered by consulting and educational firms. Below are some of the top certifications. Signifies expertise in a range of Adobe interactive and online offerings. Specialty areas include Design Specialist, Video Specialist, Rich Internet Application Specialist, Technical Communication Specialist and eLearning Suite Specialist. Verifies an expert understanding of user interface usability best practices. Shows proficiency in using different Microsoft languages and development tools to design enterprising solutions. Demonstrates abilities as a database developer or database analyst. Certifies knowledge of industry-wide standards for PHP expertise. Software engineers combine creativity and technical expertise to create operating and control systems, games, programs, and other platforms. The field of data science is driving much of the innovation in the web and mobile app industries, and the ability to extract, organize and analyze data is in high demand. Computer programmers turn ideas into instructions a computer can follow. Computer programmers may work in areas such as software development, security or social media.